London and New York, 14 July 2016 – Clean energy investment in the second quarter totaled $61.5bn, some 12% above the first-quarter 2016 figure but 32% below a very strong outturn of $90bn in the equivalent period of 2015. Looking at the 2016 trend so far, and taking the Q1 and Q2 2016 figures together, global investment in the first half of this year was $116.4bn, some 23% lower than in the opening six months of 2015, according to the latest authoritative data from Bloomberg New Energy Finance. Europe's figure for H1 2016 was up 4% at $33.5bn, and Brazil was up 36% at $3.7bn. But all the other regions were down – China by 34% to $33.7bn, India down 1% at $3.8bn, the rest of Asia Pacific down 47% at $12.1bn, Middle East and Africa down 46% at $4.2bn, the US down 5% at $23.1bn, and the Americas excluding the US and Brazil down 63% at $2.3bn. Michael Liebreich, chairman of the advisory board at Bloomberg New Energy Finance, said: "It is now looking almost certain that the global investment total for this year will fail to match 2015's runaway record. China's financing of wind and solar projects was even higher last year than previously estimated, and the hangover this year caused by weak electricity demand and policy changes in that country will therefore be all the greater." Changes in the solar market are another of the main reasons for the lower trajectory for global investment so far this year. Photovoltaic panels and project construction have become cheaper in many countries, and there has also been a shift from small-scale projects (relatively expensive in terms of dollars per MW) to utility-scale projects, which are cheaper in capex terms. While the figures for 2016 so far have been on the low side, BNEF also revealed today that global clean energy investment was even stronger last year than thought. Revised figures show that new investment in 2015 was $348.5bn, nearly $20bn above the previous estimate of $328.9bn published in January. The revision reflects information on investment transactions not disclosed at the time. The two big changes to the 2015 total are an upward revision of $29bn to asset finance of utility-scale wind and solar projects – mainly in China and the US – and a downward revision of $10bn to spending on small distributed capacity, such as rooftop solar, particularly in Japan. Abraham Louw, associate for energy economics at Bloomberg New Energy Finance, said: "One shouldn't look at these latest Q2 figures too negatively. Last year's investment of $348.5bn was really quite groundbreaking - up 11% over 2014 and 30% over 2013." The biggest category of investment in the first half of 2016 was, as usual, asset finance of renewable energy projects, at $92bn worldwide, down 19% on H1 2015. The biggest asset finance deals of the second quarter were in offshore wind in Europe, led by the $3.9bn final investment decision on the 588MW Beatrice project in UK waters by SDIC Power Holdings, SSE Renewables and Copenhagen Infrastructure Partners. Other offshore wind arrays financed in Q2 included the 450MW Borkum Riffgrund and 385MW Arkona, both off Germany, and the 400MW Horns Rev 3 in Danish waters. Big-ticket projects getting the go-ahead in other renewable power technologies included the 100MW Engie Kathu solar thermal plant in South Africa, worth an estimated $756m, the 400MW Enel Cimarron Bend onshore wind installation in the US, at $610m, and the 300MW AZTE Quaid-e-Azam PV plant in Pakistan, at an estimated $363m. Small-scale solar projects attracted $19.5bn in the first half of 2016, down 32% on the same period of last year. Much of this was down to lower costs, but there was also a marked slowdown in the largest market for these systems, Japan, where deployment amounted to $4.6bn in H1, down 66% on the same period of 2015. Public markets investment in specialist clean energy companies was $3.8bn in the first half of 2016, some 56% below that in the first six months of 2015, although there was a sharp pick-up between Q1 and Q2 this year. The top public market fundings of the second quarter were a $1.7bn secondary share issue by US electric car maker Tesla Motors, and two secondary issues by Chinese digital energy companies, Ningbo Sanxing Electric and Genimous Investment, worth $457m and $432m respectively. 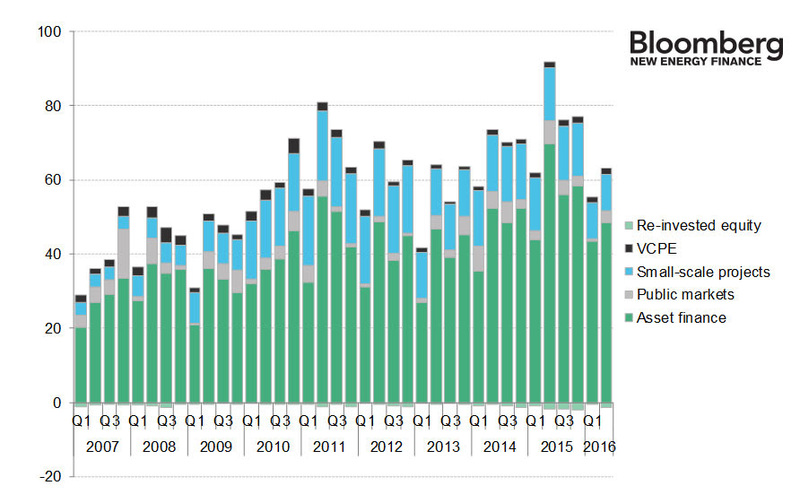 Venture capital and private equity investment in clean energy firms totalled $2.8bn in the first half of the year, up 2% on H1 2015. The biggest VC/PE deals were $230m of expansion capital for India-based wind project developer Greenko Energy Holdings, and $120m of early-stage money for Chehejia, a Chinese electric vehicle maker. See chart on the next page for the quarterly investment trend. A fact pack showing the detailed trends is available for download on this link. Note: The revised annual data show that overall clean energy investment in 2015 was a record $348.5bn, up 11% on 2014. The equivalent figures for other years are $61.8bn for 2004, $88bn in 2005, $128.2bn in 2006, $174.7bn in 2007, $205.2bn in 2008, $206.8bn in 2009, $276.1bn in 2010, $317.5bn in 2011, $290.7bn in 2012, $268.6bn in 2013 and $315bn in 2014. The annual figures include all the categories of investment calculated quarterly (asset finance, reinvested equity, small-scale projects, venture capital and private equity, and public markets), but also two other categories – corporate and government research and development and digital energy asset finance.